Nearing the end of their successful 15-year film career, Abbott and Costello produced this independent color picture co-starring the wonderful Charles Laughton. The boys tussle with pirates in a fight for treasure and love on the high seas. Brilliantly bonkers slice of sixties sci-fi kitsch that actually disguises some solid story points, even if the unintentionally hilarious script and rubber monsters derail the fear factor! The disc is pricey, however, for an average transfer and zero extras. The Doctor Who team’s excellent contemporary updating of Sir Arthur Conan Doyle’s brilliant detective, with the disc also surprising in its solid technical and supplemental aspects. If you’re a Prisoner fan, then it’s well worth going back to see what Patrick McGoohan was doing as the day job, before waking up in the Village, in this classic spy show. Two of animator-turned-director George Pal’s underrated works come to the Warner Archive, and what the discs lack in quality, the films manage to overcome with their sheer entertainment value. Warner’s multi-disc serving of classic shorts offers a step back in time to when Metro-Goldwyn-Mayer’s stars would hang out in Hollywood and enjoy entertainment at the most exclusive locations! 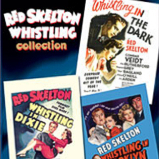 Red “I dood it!” Skelton, the comic that launched numerous classic cartoon catchphrases, stars in his signature Whistling trilogy, here fittingly collected in the Warner Archive Collection. Touchstone Pictures’ explosively entertaining end of the world epic should be quite the experience on hi-def Blu-ray, but the treatment it receives here is far from spectacular, with only so-so sound and vision, and a complete lack of extras. Another Buena Vista title gets a Blu-ray upgrade, but once again the excellent hi-def picture and sound are supported by a lackluster extras package that leaves much to be desired. Artist and cartoonist Robert L Ripley’s famed oddities and trivia discoveries began their screen life here, and though this set shows its vintage it does so very entertainingly. Producer Irwin Allen earns his Master Of Disaster tag for all the wrong reasons in this unintentionally hilarious slice of classic kitsch. They sure don’t make ’em like this anymore! Robert Rodriguez adds another children’s film to his resume. This one is mostly for kids, but with fun for adults if you don’t mind some gross-out stuff. Fun special effects and decent bonus features make the Blu-ray worth a look. Still not sure which version of Snow White is right for you? With the DVD now available, we delve into all the options including a peek inside the deluxe big red box! Those original little rascals return in a delightfully nostalgic but exhaustive collection of all 52 of their MGM-produced Our Gang shorts! Warner’s Archive Collection offers up overlooked and rarely seen movies, including the George Pal-produced tongue in cheek adventure Doc Savage: The Man Of Bronze. Warner’s Archive Collection offers up overlooked and rarely seen movies, including the prototype cop-buddy comedy Freebie And The Bean. Warner’s Archive Collection offers up overlooked and rarely seen movies, including the exciting matinee style adventure Captain Nemo And The Underwater City. Warner’s Archive Collection offers up overlooked and rarely seen movies, including legendary director Raoul Walsh’s T A Distant Trumpet. Warner’s Archive Collection offers up overlooked and rarely seen movies, including Byron Haskin’s Captain Sindbad reviewed here. Warner’s Archive Collection offers up overlooked and rarely seen movies, including Irwin Allen’s The Big Circus reviewed here. Robert Rodriquez turns Frank Miller’s Sin City strips into a visceral movie and a adult, but terrific Blu-ray experience! Klaatu Keanu’s latest, The Day The Earth Stood Still, takes a few diversions from the excellent Robert Wise original, aalso handily included in this Blu-ray set in high-definition! The classic live-action comedy The Odd Couple is the latest Paramount picture to be added to its Centennial Collection. Those Daring Young Men In Their Jaunty Jalopies, or Monte Carlo Or Bust! Director Ken Annakin’s follow up to Those Magnificent Men In Their Flying Machines swaps planes for cars, the result being that Those Daring Young Men In Their Jaunty Jalopies provides just as much entertainment value. Director Michael Winner was an “interesting” choice to put in charge of a family film, and it’s not an entirely successful outcome, being tinged ever so slightly with some questionable material in an otherwise engaging film that’s packed with old-time screen legend cameos.